A solid walnut bedroom set was hand carved in Italy about 1900 in the Renaissance manner, and comprises a king size bed and two marble top nightstands. The bed has been expertly adapted to fit a standard modern king size mattress, the demonstrator shown is 18" deep as shown. The restored finish is in excellent condition on this classical antique furniture. A pair of upholstered pallets is included to use instead of a spring unit, to keep from covering the headboards. Cross supports with center legs are also included. 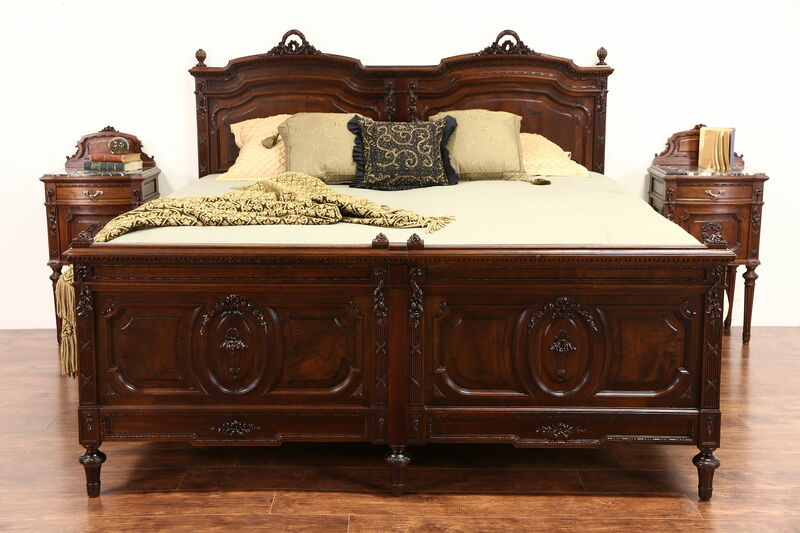 Dimensions are 79" wide, 88" long, the headboard is 57" tall and the footboard is 33" high. A true right and left pair, nightstands have original solid brass hardware and drawers with hand cut dovetail joints. The original finish is in extremely fine condition and has been waxed and buffed, so all that is needed to maintain the warm patina is an occasional wipe with a soft dry cloth. The famous "Nero Portoro" marble tops have been polished and sealed to resist stains. Size is 19" wide, 16" deep, 39" tall and the marble is 32" high. The matching armoire in photos is priced separately, call or email for availability.